MOBILE, ALABAMA (July 16, 2018) – “Today’s Homeowner with Danny Lipford,” the Emmy-nominated, nationally syndicated television show currently in its 20th season, reached an all-time high audience with 1.9 million weekly viewers during May 2018 Nielsen sweeps ratings. These numbers represent a 9% increase over the show’s previous top audience record. National Home Improvement Expert and Host of “Today’s Homeowner,” Danny Lipford, attributes the show’s continued growth and success to its realistic approach. One significant change that has taken place during the show’s 20th broadcast season is the elevated position of Lipford’s daughter, Chelsea Lipford Wolf, as full-time co-host. Wolf has been a part of the show for several years, but this season she took on a much larger role in planning and completing projects and working alongside her dad. Additional features of the show’s landmark 20th season include several service project episodes, along with a dedicated anniversary web section with archive photos and a special video history of how “Today’s Homeowner” began and its journey to present-day. 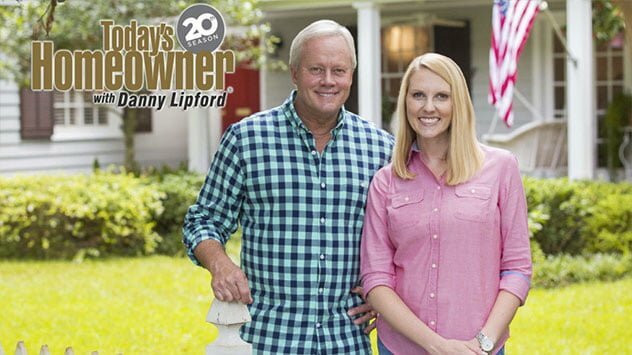 Each week on “Today’s Homeowner,” Danny Lipford and co-host Chelsea Lipford Wolf work with real homeowners to handle simple repairs, maintenance and improvement projects around their homes. Some of the show’s most popular themes include budget-friendly renovations, seasonal home maintenance advice, Simple Solutions, which offer clever life hacks and remedies for handling common home issues, and Best New Products, which preview the latest-and-greatest home improvement tools and gadgets on the market. “Today’s Homeowner” is the highest-rated syndicated home improvement TV show on the air, and broadcasts weekly on 214 stations in the U.S. covering 91% of the country. The show will kick off its 21st season with a “Customize Your Space” episode premiering the week of September 17, 2018. A full listing of stations and air times is available on the Today’s Homeowner website. Today’s Homeowner is a trusted home improvement authority delivering fresh, original, practical advice to consumers across diverse media platforms including the top-rated, nationally syndicated “Today’s Homeowner” television show, now in its 20th season, and its radio counterpart, the nationally syndicated “Today’s Homeowner” radio show. Additionally, the media brand hosts the top home enthusiast destination website, TodaysHomeowner.com, drawing more than 2.5 million monthly visitors, robust social media channels and the award-winning lifestyle blog and web series, Checking In With Chelsea. 3 Echoes Productions, the professional production arm of the brand, serves an impressive national clientele with expert video services. Host and founder of the brand, Danny Lipford, is among the most sought-after home improvement experts in the country. The seasoned remodeling contractor and media personality served as the home improvement expert for CBS’s “The Early Show” and The Weather Channel for over a decade and has made more than 190 national television appearances on “FOX & Friends,” “Inside Edition,” “Morning Express with Robin Meade,” FOX Business Channel, “Rachael Ray” and more. Hi, Leigh! We don’t currently have an app, but the “Today’s Homeowner” TV show is available on Amazon Prime for members. Of course, you’re also welcome to catch full episodes right here on todayshomeowner.com! Where is ur app 2 join? Want 2 get ur tv show on my phone.